"In the milonga everybody sees everything"
When you walk into a milonga in Buenos Aires for the first time it might not look like anything special. You’ll see some couples dancing tango, and maybe some other people sitting around at tables. The only unusual thing an outsider may notice is that the men and women are sitting apart when they aren’t dancing— often facing each other on different sides of the room. And if there are couples, they are usually sitting in a different area. But of course there is a lot more going on than meets the eye. A very complex social ritual is taking place that has been refined for almost 100 years. The people are following a set of rules called “codigos”. They aren’t written down, but the milongueros and milongueras who have been around for a long time know them— and they follow them. Violate them at your peril. The purpose of the codigos is to allow things to run smoothly. 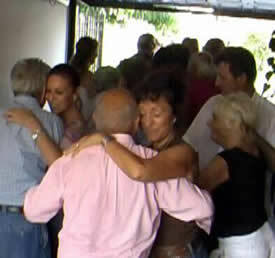 A crowded milonga is a highly charged environment. Milongueros and milongueras are proud people, and tango is a very passionate thing. There is always some romantic tension between the men and women, and also, of course, a bit of competitiveness between the dancers as well. Pack two or three hundred people in a room together, and the need for a set of rules to minimize conflict becomes obvious. This was the world that I wandered into five years ago—and I have been addicted to it ever since. It was a lot of fun to write about, although in the beginning I was incredibly green, and I made the classic beginners mistakes. But I’ve learned a lot since that first night in El Beso, when I blatantly violated one of the most well known codes of tango by walking over to a table of Argentine women I didn’t know, and asking one of them to dance. (I was with my friend Malik at the time, and I can still hear him laughing and saying, “Denied! Denied!”—a basketball term for a player who has the ball is slammed right back at him after taking a stupid shot). Since that inauspicious debut, I’ve learned a lot. I know there are codes that cover almost everything that happens in a milonga, and although I don’t know them all, I would like to discuss a few things that should help a newcomer to the BsAs milongas make it through the first few years without too much embarrassment. 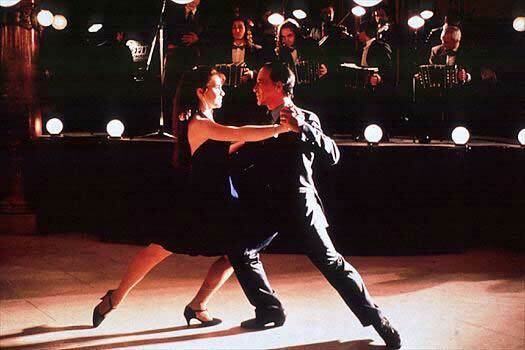 In Buenos Aires they say that, “In the milonga, everyone sees everything”. It means that from the moment you walk in the door, to the time you leave, you will be watched. Your clothing, your walk, your posture, where you sit—all will be scrutinized. I learned this the hard way. Several years ago we were in a place called Afiche. It doesn’t exist today, but at the time El Pibe Sarandi had a milonga there. It was only a small restaurant with a tiny dance floor, but because El Pibe is a serious milonguero, many of the important dancers in BsAs squeezed inside to eat and dance. One night Alejandra and I were there with a woman from the U.S. We were tired and, and all we wanted to do was eat something and listen to a friend who was there singing tango—but the woman had come all the way from the U.S., and she really wanted to dance. She was not very experienced, and I had no desire to dance with her— but it was clear that the milongueros weren’t going to ask her, and it looked like she was going to sit all night. So, finally I decided to be a nice guy and I asked her to dance. It was the last song of a tanda, and the small floor was packed. We sort of squeezed into the middle, and I shuffled through a tango— but my heart wasn’t in it. Then we sat back down, and I felt pretty good about having done my duty. A few minutes later, a milonguero came over and asked me to step outside. I had no idea what he wanted, but I followed him out. We stood on the sidewalk for a minute, and then he said, “I saw you dancing.” I thought maybe he was going to say what a nice guy I was for dancing with the tourist… but no. Instead, he said this: “You can do better than that. You can’t come here in front of these people and dance like that. When you dance tango you must give everything. Wait for the right music, and then give EVERYTHING!” He kind of tapped me on the chest as he said it. Then he said, “If you can't do that, do not dance.” And he went back inside. Wow. 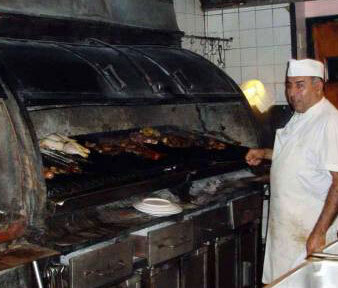 “Todo la carne en la Parrilla!” All the meat on the fire. What an Argentine way of putting it. I thought about a friend of mine who told me about his great leap forward in skiing. He said he was slogging along one day, and suddenly he got mad at himself. So he skied down to the lodge at Squaw Valley, took off his skis, went into the restroom, looked in the mirror, and said, “You’re either going to go hard every minute you’re on the mountain, or your going to go home and put your skis away for good.” And after that, he became a great skier. (Well, he was already a great professional skier, but he got a lot better). So, I looked in the mirror and did the same thing. I decided to film all the milongueros, so I could really learn tango. And I began to prepare for the milongas like a sports competition. I would spin on the bike to loosen up, and take time to stretch and warm up before going out. I began to dress up, with polished shoes, neat hair, and often, a coat and tie. And the milongueros noticed— because the saying is true. In the milongas, they really do see everything. In the end, those words on the sidewalk that seemed so harsh at the time turned out to be the best single piece of tango advice I ever received. In fact, they sort of became my motto. When I first put up this web site, I used them as a subheading, under the “Tango and Chaos” title. And they are still there today. One of the most insulting things that can be said about a person in the milonga is that they want to “llamar la atención”…they want to “call the attention”. Even the very best milongueros display a low-key, respectful attitude in the milongas. Good dancing is admired and appreciated, but a milonga isn’t a place to show off. Talking loudly, jumping around on the dance floor, or even walking around in a conspicuous way will be noticed. Unfortunately, foreigners have a reputation for doing this. The regular dancers are complaining more and more about bad behavior by the tourists who have been flooding the milongas over the past year. Sometimes it’s easy for someone who is a superstar in his own city to think he or she is really making a big impression in BsAs, especially when the older people dancing around him seem so low key. It’s best to remember that people are moving in an understated way, at least in comparison to many milongas outside of Argentina, and that they are dancing tango in subtle ways that most foreigners can’t begin to see without many years of experience in Buenos Aires. At this point, we may have painted a somewhat bleak picture—a room lined with serious looking men and women passing judgment on everything and everyone about a dance that only they can do, and a set of rules that only they understand. And that is a reality of tango. But it’s only one reality—only one of many complex parts. Another reality is that tango is lots and lots of fun. If it weren’t, thousands of people every night wouldn’t be packing into the milongas to enjoy it. Earlier I said, somewhat ominously, that you violate the codigos “at your own peril.” This should be explained. What does happen if you break the rules? Well, it depends. But basically… nothing happens. One of the real keys to understanding what’s going on in tango is language, and foreigners are at a tremendous disadvantage. Not only is it hard to understand what people are saying in a milonga, it is also virtually impossible to understand the lyrics of the music—and these lyrics are tremendously important. (We plan to discuss them in future pages, but for now, let’s leave it at this: probably the most important thing a tango dancer can do to improve his or her dancing is to learn the lyrics of the songs.) Language is a small window into the way people think, and time and again as I pick up more castellano, I am reminded of this. The phrase above is an example: when the people use “llamar la atención” they are saying something very specific. They aren’t talking about psychological motivation, the way we might use “show off” or “ego” or “insecure”. They aren’t making a value judgment about that person’s character. They are simply saying that the person doesn’t understand tango, and their place in the milonga. It’s a small violation with a small penalty. So, again, what are the penalties? At the worst level, a person might be asked to leave. Or they may find they are bumped and blocked when they try to dance. But these things are very rare. There is a phrase you hear time and again: “El no existe.” It means that person does not exist—it refers to a man (or woman) who isn’t there. And, depending on who you are, this can be a blessing or a curse. For beginners and foreign tourists it’s a blessing. It means you are invisible, and can do pretty much what you want. The milongueras and milongueros will be polite, and even friendly, but you don’t exist inside their world of codes and dancing. For a regular in the milongas it can be a bit worse. It means that you don’t exist in terms of the cabeceo. That is, the chair you are sitting in becomes empty, and a man or woman looking for a dance simply doesn’t see you. Finally, worst of all, it can mean that a person is unwelcome. They don’t exist socially. They don’t exist in the cabeceo, they aren’t welcome at other peoples tables, and they are never invited anywhere. This is very serious if it happens to someone who regularly goes to milongas. It’s rare, but it happens. in a milonga, and take up too much floor space. 1. The ability to do smooth tight giros (turns) in both directions, at any time during the dance. This allows a trapped dancer to instantly dance on a dime until space opens up. And if you are “bien parado”, your head will be up while you turn, so you can constantly survey the area around you, and look for space to open up. 2. The ability to step smoothly and quickly in any direction. This means being able to instantly take a step of any length in any direction, and to bring your partner along with you. A leader should be able to turn, look, and then slip to the front, back, or side quickly and smoothly when there is space. 3. The ability to step on the weak beat, and lead your partner along as well. This is part of musical expression, but quick steps are also a big part of navigation. They allow a dancer to fine tune speed and direction to steer around the floor, and to avoid bothering other dancers. A group of dancers practicing these skills will be able to use the available floor space with maximum efficiency, and minimum interference with each others dancing. slightly larger than an automobile. At an advanced level, navigation is more than a survival skill. It’s an essential part of the art of tango. The path and manner that a leader moves around the floor are an advanced way of expressing the music, and navigation actually becomes a part of artistic expression. Very good couples dancing close to each other are expressing the music together by the way they flow around each other. This is a big reason why good milongueros seek out each other’s company. Just like dancing with a good partner, dancing close to other couples who really know tango is a better experience. 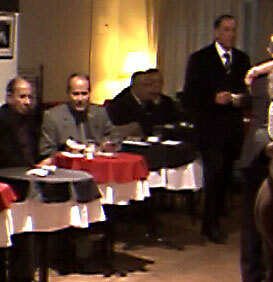 And it is why we try, whenever possible, to film dancers in a milonga dancing next to other good dancers. It is a completely different thing than dancing on a stage or in a studio. 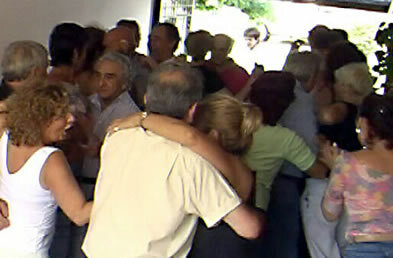 In the pictures above, about 30 people are dancing together comfortably in a small one car garage. They represent a cross section of some of the best dancers in town, and it’s obvious from the casual clothing and the facial expressions (and of course the unusual location) that this is not an ordinary milonga. These are pictures of an important part of Buenos Aires tango that has been around for many years… but it is almost unknown to outsiders. We’ll discuss it later.